This topic describes how to use the -INCLUDE command to insert a report procedure (FEX) within another report procedure (FEX). It also describes how to use the -MRNOEDIT command to ignore code in a procedure (FOCEXEC). Using the -INCLUDE command, you can insert a report procedure (FEX) or style sheet file (STY) within another report procedure (FEX). For information on creating report requests and creating style sheet files, see the Creating Reports with WebFOCUS Language manual. When you create a report procedure in the repository content folder path, a unique path and file name reference is created, based on the folder the report is created in and the file name and type specified. Note that there are file naming rules that replace most non-alphanumeric characters and modify the file name, when necessary. The full path is the value to specify when referencing a report procedure or style sheet file in a -INCLUDE command. The full IBFS path information, including file name, can be obtained by selecting the report and then selecting the Properties option. Note: WebFOCUS 7.x report procedures migrated with -INCLUDE commands, coded with the 7.x Managed Reporting Repository Internal HREFs, are supported in WebFOCUS 8. This is because the WebFOCUS 7.x internal HREF references are migrated with the properties information for an item (for example, a report or style sheet file). Items created in WebFOCUS 8 must be referenced by their full IBFS path. The following image shows the Properties dialog box for a report procedure (FEX) with the full path. The following code illustrates how to incorporate a report procedure (FEX) using IBFS path with -INCLUDE command. Note: In releases prior to WebFOCUS 8, a procedure or style sheet file that is located on a Reporting Server can be incorporated within a Managed Reporting procedure, using the -MRNOEDIT command prior to the -INCLUDE command. The -MRNOEDIT -INCLUDE command is supported in WebFOCUS 8. Is the full path, including filename, of the report procedure (FEX) or filename.sty of the style sheet file. The file extension is optional when a report procedure (FEX) is referenced. Is the application directory path on the Reporting Server in which the server procedure (FEX) or style sheet file (STY) is located. If this is not specified, the file must be on the application path of the Reporting Server. Is the name of the procedure located on the Reporting Server. The file extension is optional when a report procedure (FEX) is referenced. When incorporating a style sheet file, specify the STY extension. Is the Reporting Server node defined in the WebFOCUS Client configuration. The IBFS://EDA/ path specifies that the procedure or style sheet file is located on a Reporting Server. Managing Reporting processing removes IBFS://EDA/nodename from the Managed Reporting request when submitting the request to the Reporting Server because the Reporting Server processing will use its application path to locate the procedure or style sheet file. Is the application directory on the Reporting Server in which the server procedure or style sheet file is located. If this is not specified, the file must be on the application path of the Reporting Server. Is the name of the procedure or style sheet file located on the Reporting Server. The file extension is optional when a report procedure (FEX) is referenced. When incorporating a style sheet file, specify the STY extension. A best practice in WebFOCUS 8 application development is to centralize report styling and environmental setup, such as JOINs and DEFINEs, by storing them in a common domain and defining security permissions to permit users to read and run them, but not edit or change them. However, legacy applications may require referencing report procedures and style sheet files that are located in an application directory on the Reporting Server. The information in this section is for legacy applications that have been migrated. The following is an example of incorporating a Reporting Server procedure or a style sheet file within a Managed Reporting procedure using the -MRNOEDIT and -INCLUDE command. 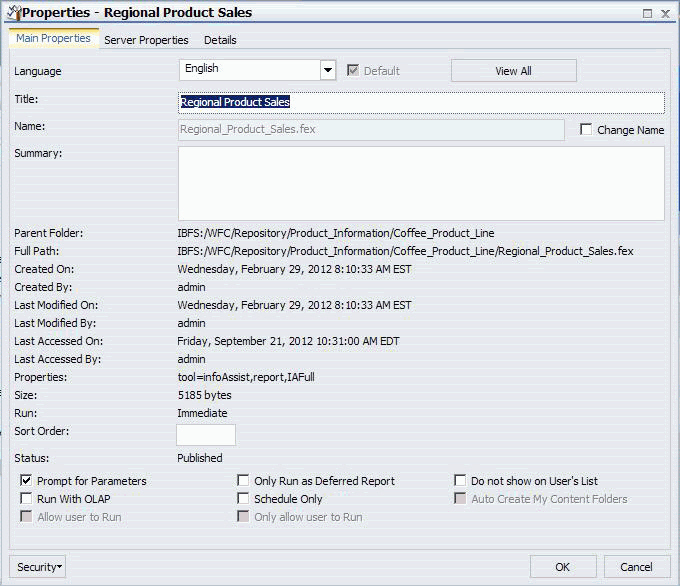 The salesrptsetup procedure, containing the following commands to create a field commonly used in the product sales reports, is located in the /ibi/apps/ibisamp directory on the Reporting Server. The salesrptstyle.sty style sheet containing the following styling commands, is located on the Reporting Server in the /ibi/apps/ibisamp directory. The Managed Reporting procedure incorporates the salesrptsetup procedure and salesrptstyle style sheet located on the Reporting Server. "Regional Inventory and Profit Report"
From the Reporting Server, for each task within a schedule, ReportCaster supports receiving a single answer set, such as report, chart, or HTML file. Therefore, when using -INCLUDE to incorporate a procedure into a procedure that will be scheduled with ReportCaster, only one answer set should be created. If you need to distribute multiple reports within a single document, use the Compound Report feature. 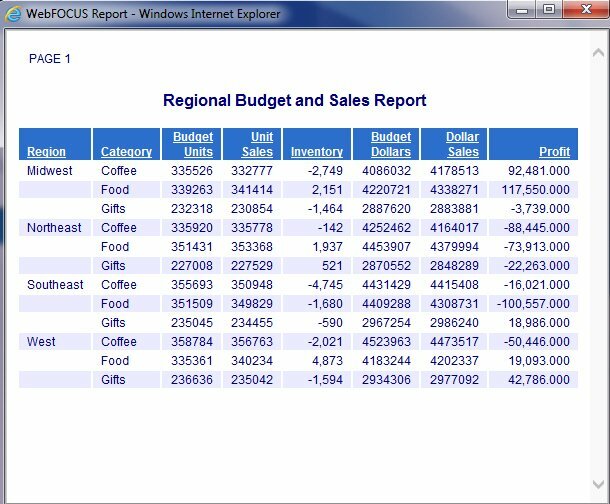 For more information, see the Creating Reports With WebFOCUS Language manual. You can instruct Managed Reporting to not process single lines or blocks of code using the -MRNOEDIT tag. Note: Both lowercase and uppercase syntax are supported for the -MRNOEDIT tag. The focexec_code must fit on the same line. The syntax above is not part of the FOCUS language. It is used only by Managed Reporting. Managed Reporting will not process the lines when evaluating the Managed Reporting procedure prior to sending it to the Reporting Server. The lines of code will be passed without the -MRNOEDIT tags to the Reporting Server. Both lowercase and uppercase syntax are supported for the -MRNOEDIT tag. Managed Reporting ignores the -INCLUDE salesrptstyle.sty command. Without the -MRNOEDIT tag, this would result in retrieval of the FOCEXEC from the WebFOCUS Repository. In this case, the -INCLUDE is resolved on the Reporting Server. Therefore, salesrptstyle.sty should reside on the path of the Reporting Server.